We were told to be at the airport 3 hours ahead of our flight. Well, since the Dayton airport doesn’t open until 4am and our flight is at 5:20, that wasn’t possible. We were unable to do online check-in at home so we knew we had better be at the airport right at 4am. Mission accomplished! The airport was virtually empty. We were able to do the kiosk check in and were through security in about 2 minutes. So far so good. The reason for not being able to do online check-in was because we had to scan our passports at the airport. I’ve had mixed success with online check-in for international flights. Some will allow me to check in for the domestic leg of the trip and others have made me do in-person check-in for the entire route. You just don’t know until 24 hours before the flight. 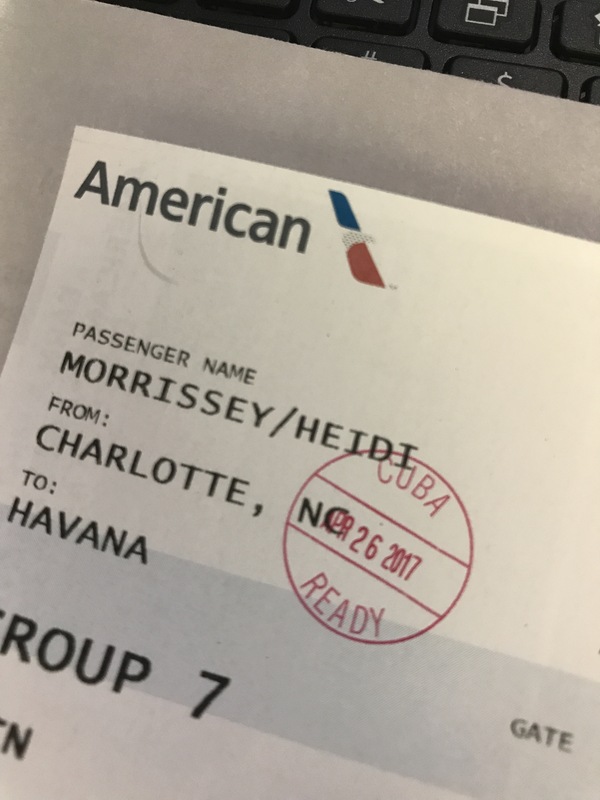 When we got to Charlotte, we had to be approved by the Cuba ready ticket agent. We expected a long line and lots of questions. What we got was a 30 second stop at a tiny counter where our passport and visa were checked, stamped and passed back to us without question. We had time to grab a coffee and some breakfast before boarding our flight to Havana. 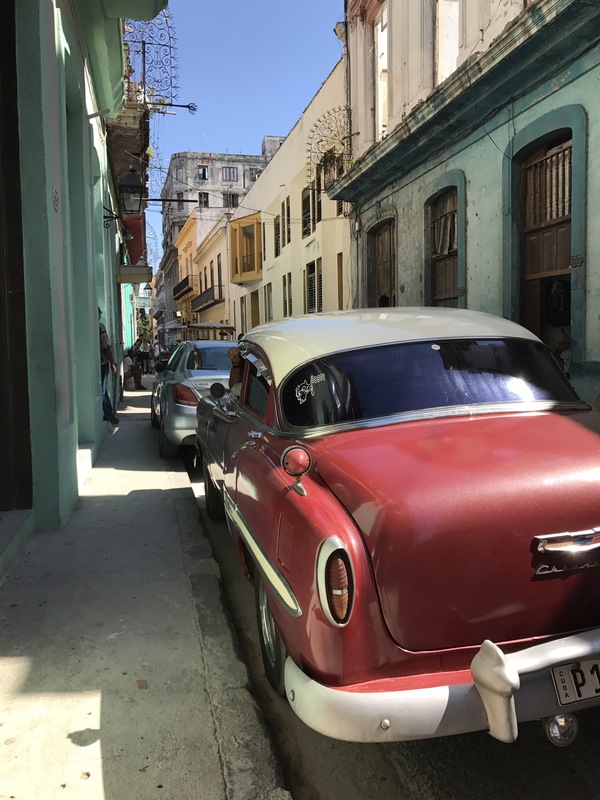 Our flight to Havana was uneventful. We even arrived about 20 minutes early with only 40 passengers on board. Going through immigration was nothing! We literally handed them our passports and were on our way. We then had to go through security again (?) and had to pass through a medical station where we simply dropped off a form that stated we were healthy. Little did we know that we were also supposed to grab a second customs form when we passed through security. It was not a big deal. We simply retraced our steps and picked up the forms for ourselves and about ten of our flightmates (is that even a word?). A quick scribbling of my signature and we were free from all airport restrictions. 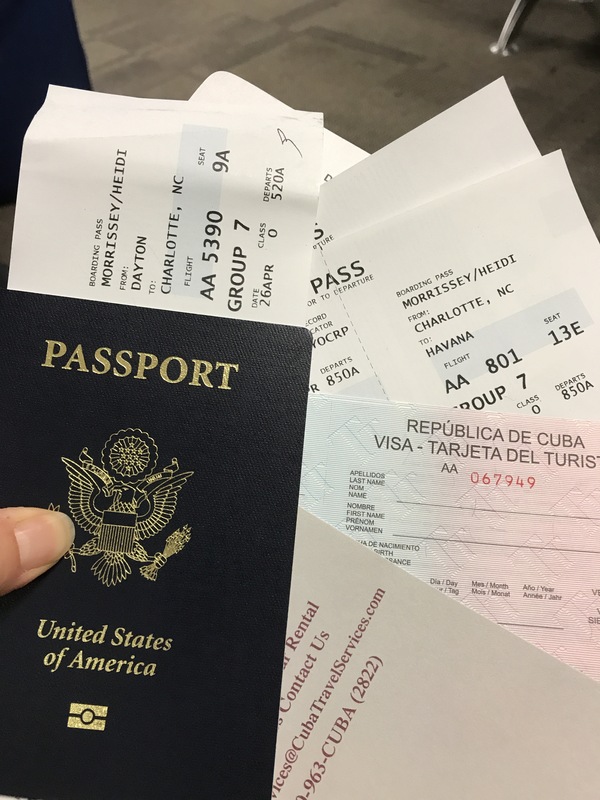 Once we arrived in the arrivals area, we were supposed to look for our “chofer.” We also needed to exchange money, but I had heard it was better to go to the departures floor upstairs to avoid lines. Turns out that was good advice. I quickly ran upstairs and exchanged my Euros into CUCs. In the process, I was complimented on my beautiful Spanish accent and told that I must be from Spain! That’s a first! We waited about 45 minutes before our driver arrived. Without having the ability to call him and since our flight was early, we figured it was best to hang out and wait for him. Sure enough, around 12:15pm, Orlando arrived with a sign that had my name on it. 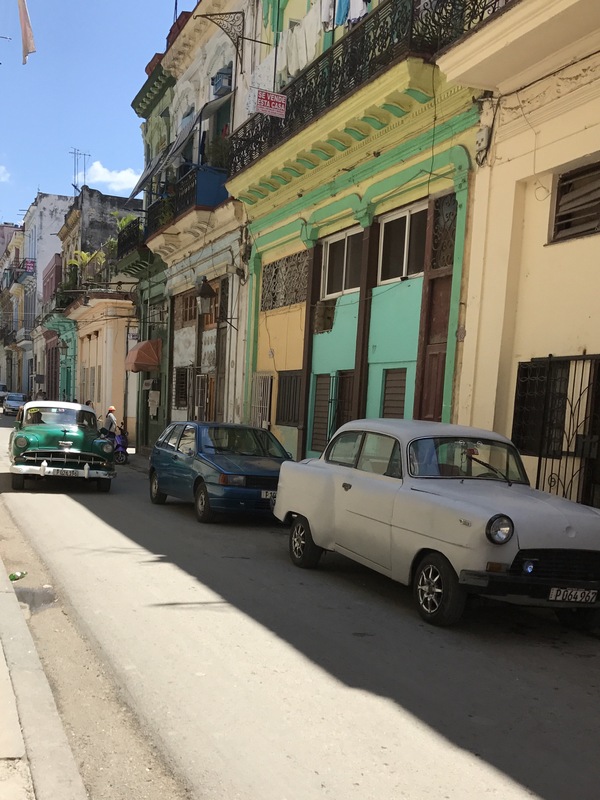 We exchanged pleasantries and were on our way into the main part of Havana. 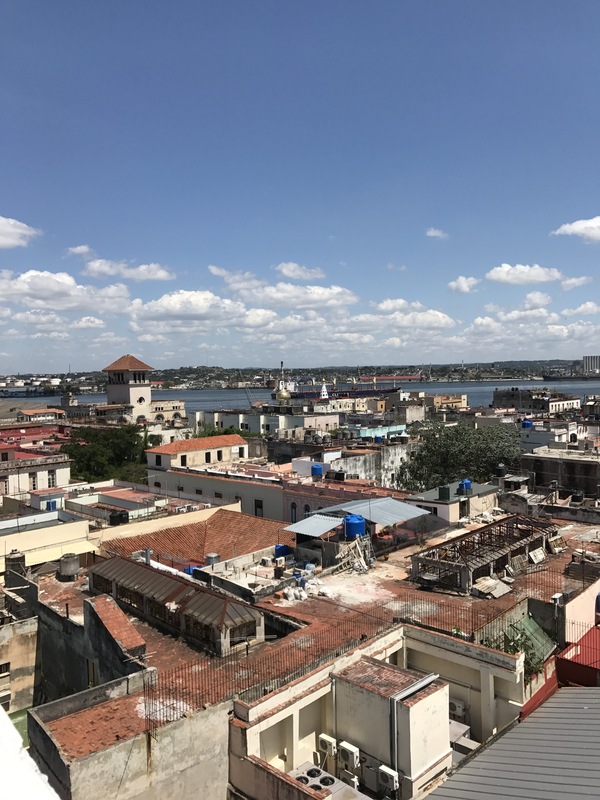 We truly didn’t expect that he would take us on a tour of some of the main spots along the way like Revolution Plaza and the University of Habana. 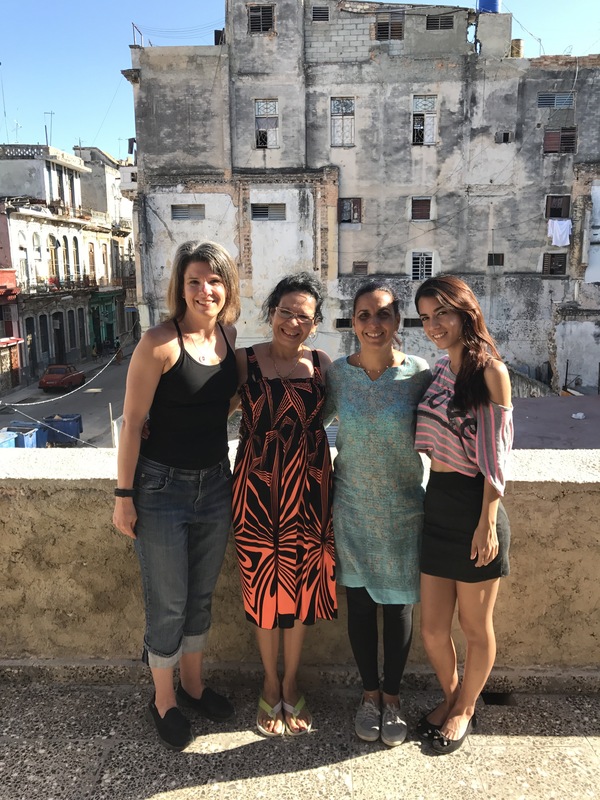 We had our first friend in Cuba! We made arrangements for him to take us back to the airport on Saturday morning! 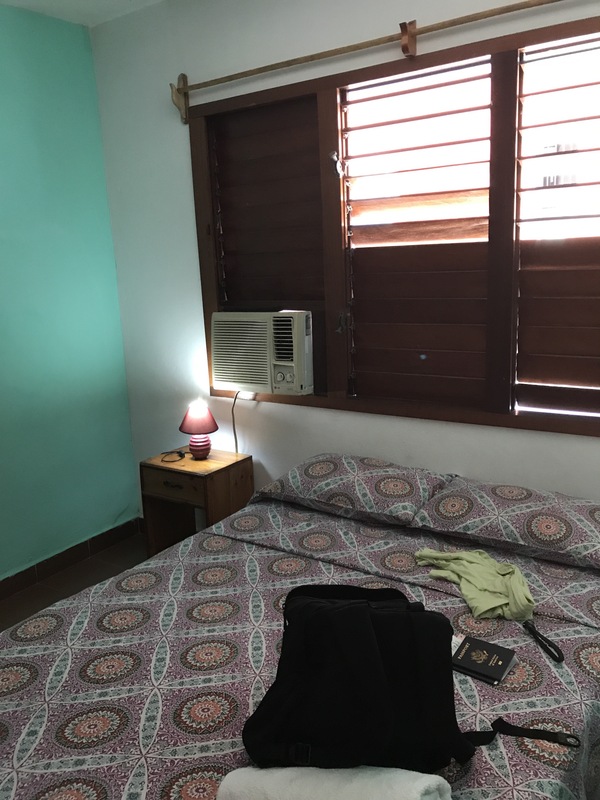 When we arrived at our Casa Particular, Casa Eliezer Verde, we were warmly greeted by our hostess Doris and her Tia Gisel who is the housekeeper. I got my second compliment when our chofer, Orlando, introduced me to Doris and told her my Spanish was better than his! Wowza! Either my Spanish has gotten really good or they are just really kind! I’m betting it’s the latter! They gave us a tour of our amazing home away from home and told us about their families. Staying in a Casa Particular is the way to go! 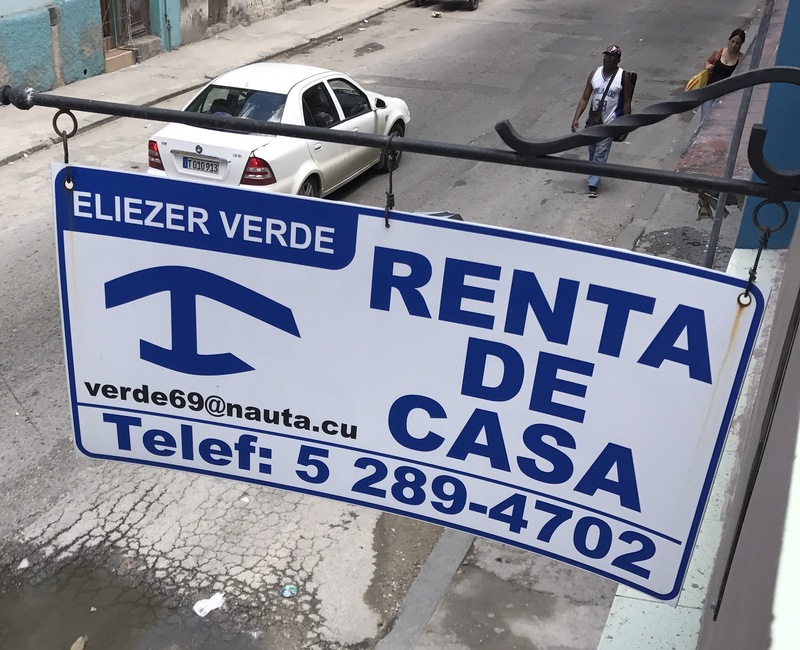 We are paying about $50 per night for a two bedroom apartment with AC that is walking distance to literally EVERYTHING in Havana. 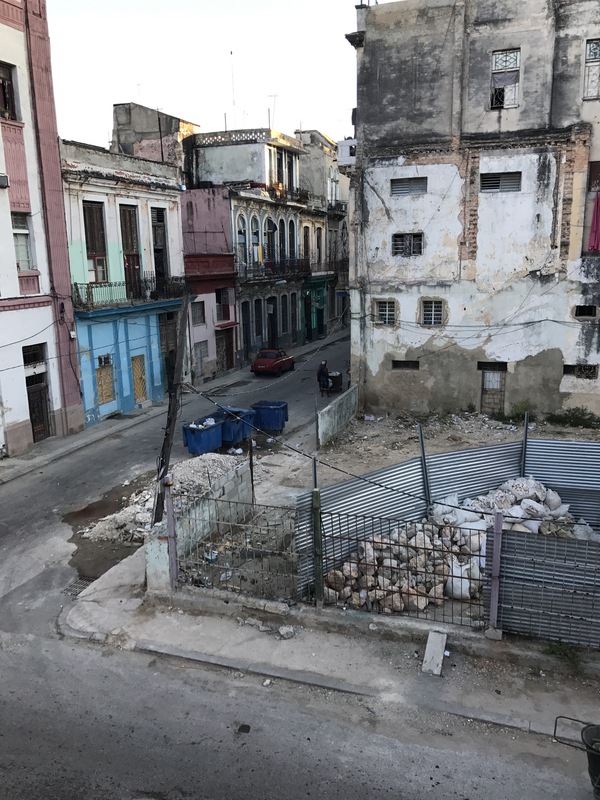 We are staying in Central Havana which is where Cubans live. It is an extremely poor, dilapidated part of the city. It is also extremely LOUD, but very safe. There is life in the streets and I love it! We have a terrace that overlooks Calle Colon. As I type this, I hear two types of music, a dog barking, old Chevy’s driving by with their loud engines and people laughing, talking and selling ice cream. What a place full of life! For $5 each day, Doris is coming back to make us breakfast on our terrace. I look forward to seeing her each day. She and her husband Verde have two daughters. One is in medical school and the other is in her last year of high school. Our housekeeper has a daughter and two grandchildren. I already feel like we’re part of their family! We were starving when we arrived and I had already scouted out a place for a cheap sandwich. 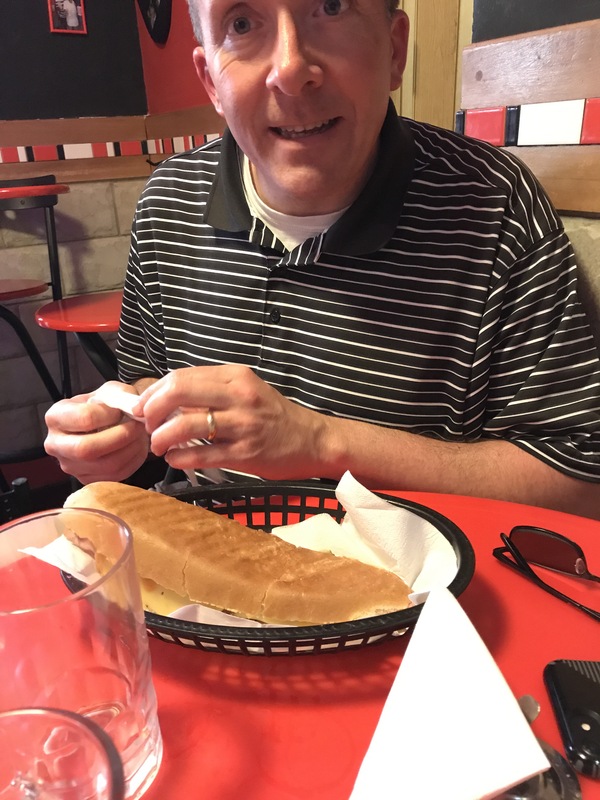 Brian and I walked to La Sandwicheria Bien Pago and paid $9.90CUC for two huge Cuban sandwiches, a bottle of water and two beers, including tip. We even had air conditioning! 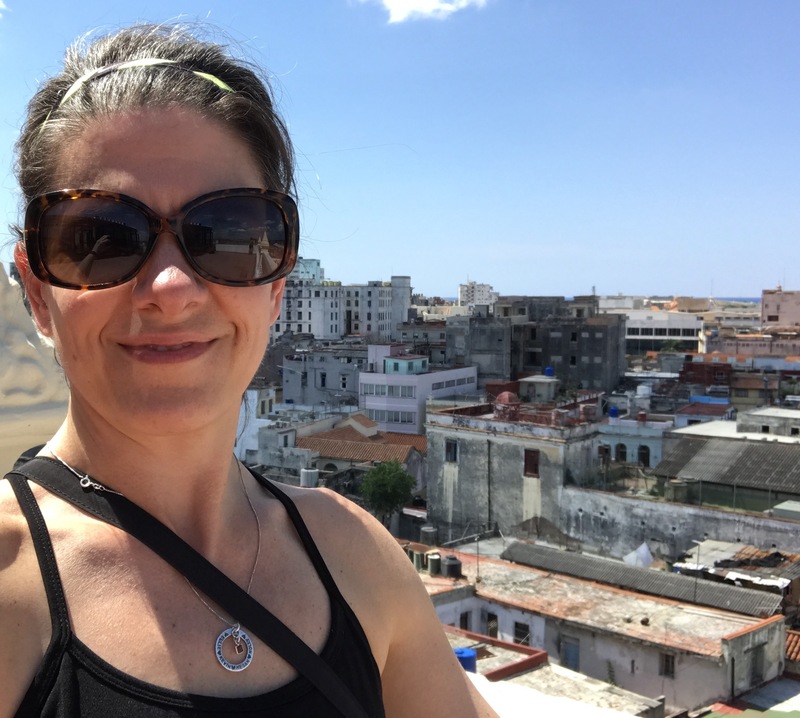 After lunch, we walked through Habana Vieja (old Havana) to get our bearings. We stopped at the Camera Oscura, a periscope designed by Da Vinci that allows people to see a 360 view of the city. We had a guide who talked us through the experience. We also got a chance to enjoy the views from the terrace. This was a great way to get acclimated to the city! 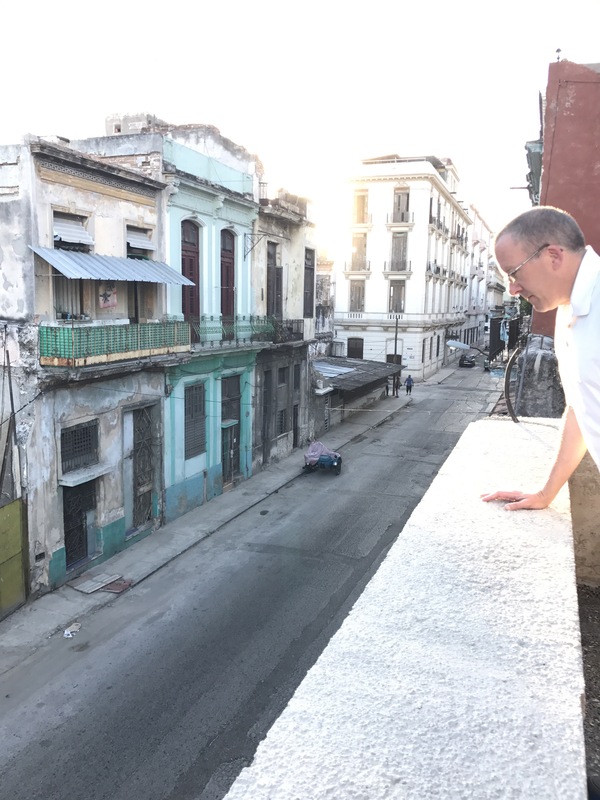 Following our experience at la Camera Oscura, we visited the Cathedral and La Bodeguita del Medio. 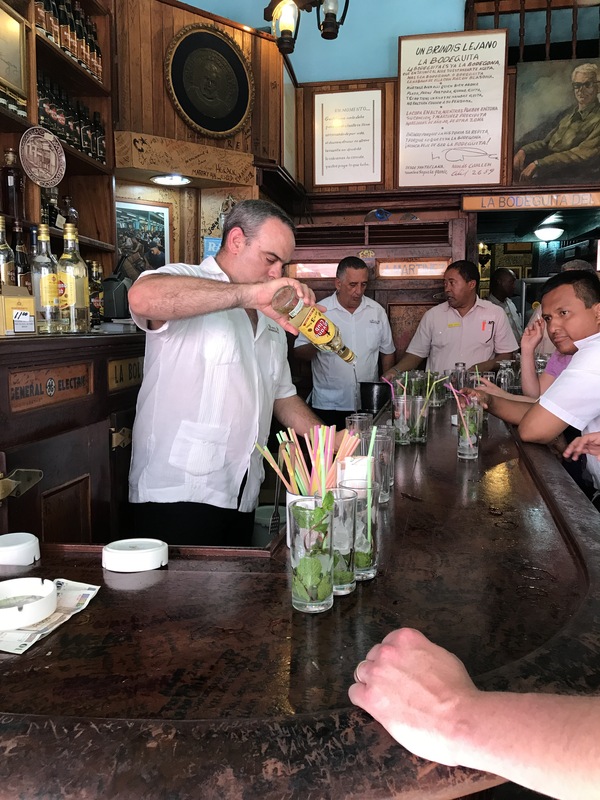 La Bodeguita del Medio is famous for it’s guest, Ernest Hemingway. He came here for the famed mojitos. We bellied up to the crowded bar and ordered our obligatory, over-priced drinks ($5 ea) and then sat and drank them while listening to some great live music. Tourists filled the small space the entire time, many of them only stopping to take a selfie and not to buy a drink. Not cool! It was definitely a touristy thing to do, but we enjoyed it. Those mojitos go down really smoothly when you have been walking in 90 degree heat for a couple of hours! After that, we tried to get an internet card, but the ETESCA store was closed. I hear that’s pretty common! We made our way back to our casa and both promptly fell asleep sitting up! Our hosts have left us with a fridge full of bottle water and beer. There is a price list and an inventory on the front. $1 for water, $1.35 for beer. As I type this, I’m sitting on my terrace couch with a cold Bucanero beer enjoying the sounds of la Calle waiting for Brian to wake up for dinner. Not too shabby! After our nap, we headed to a local paladar (privately owned restaurant) called Dos Pelotas. We were the only tourists inside. We ordered pork, but were told it was gone (not unusual from what I’ve heard). We both ordered chicken and waited patiently to see what we got. Turns out we basically had Chinese takeout. 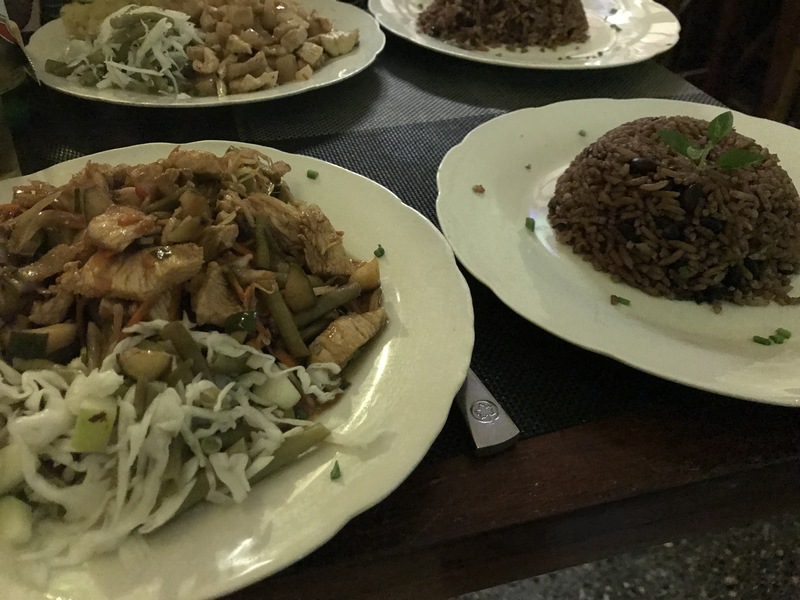 Mine was chicken with vegetables, vianda (mashed root vegetables), rice and beans. Brian’s was chicken with pineapple and the same sides. 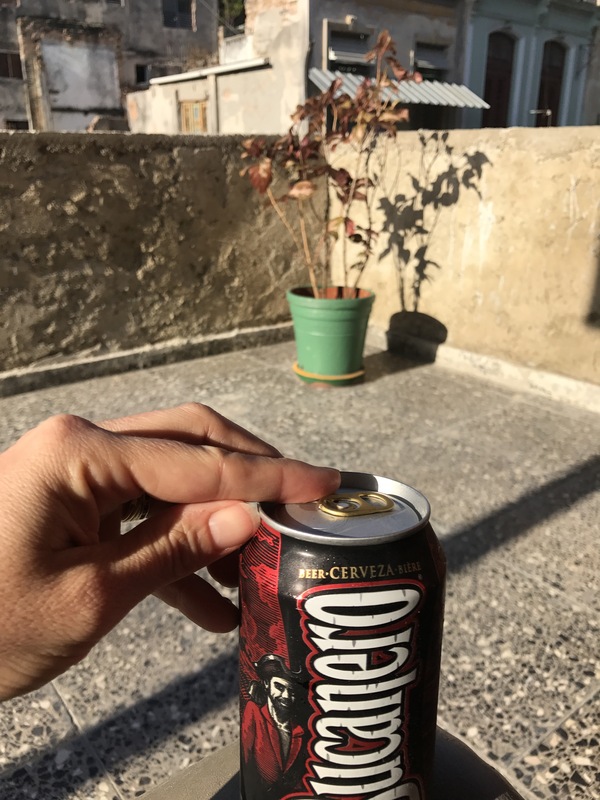 We each had cerveza (President this time, not Crystal or Bucanero) and our total including tip was less than $20CUC ($20 USD). It wasn’t great, but we would have eaten mulch if they had served it! We were starving! 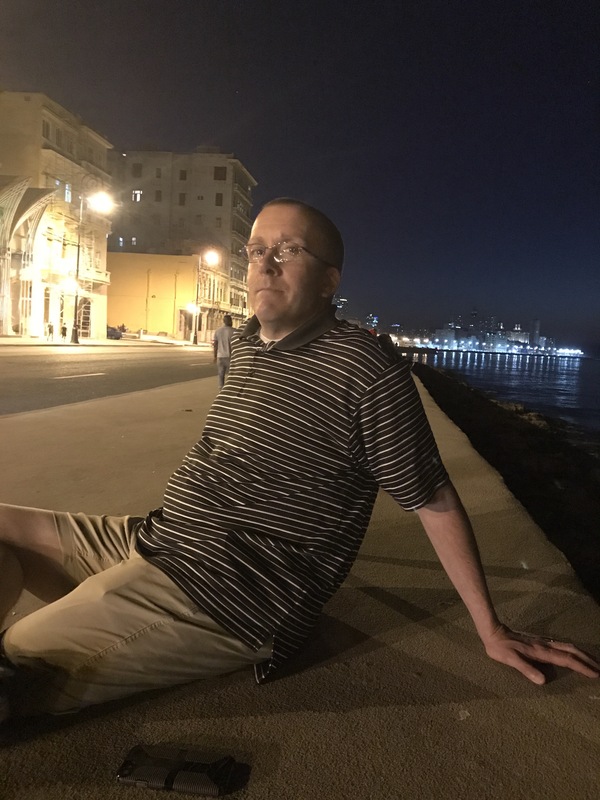 After dinner, we walked the Malecon for a while and watched the locals as they talked, snuggled and played music under the stars. It was very romantic! We look forward to going back later this week. As we made our way back to our casa, we looked for something sweet, but couldn’t find anything. Exhausted from our day, we went back home and hit the sheets by 10:30pm.